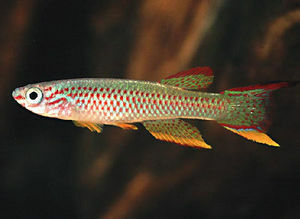 Please copy and paste ' [[Category:Killifish]] ' into the end of your article to include it in this category. 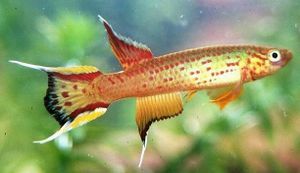 A killifish is any of various small, mainly oviparous (egg-laying) cyprinodont fish (order Cyprinodontiformes, family Cyprinodontidae). The name killifish is derived from the Dutch word "kilde", meaning small creek, puddle. The two primary families for Killis are Nothobranchiidae and Aplocheilidae. Rivulidae is a smaller group of fish which are also classed as Killifish or Pearlfish. Most Killies are small fish, 2.5-5cm (1-2"). The largest is under 15cm (5.9"), but only a few species are this large. Although Killifish is sometimes used as an English equivalent to Cyprinodontidae, some species belonging to this family have their own common names, such as the Pupfish and the Mummichog. See here for a list of Killifish common names. This page was last edited on 27 August 2015, at 09:32.